Talk about bang for your buck! Dorie’s Mustard Batons recipe (a previously completed French Fridays with Dorie recipe which I am just now catching up with) is seriously easy. She has posted her original recipe on her website, but it is so easy that it barely requires an actual recipe. 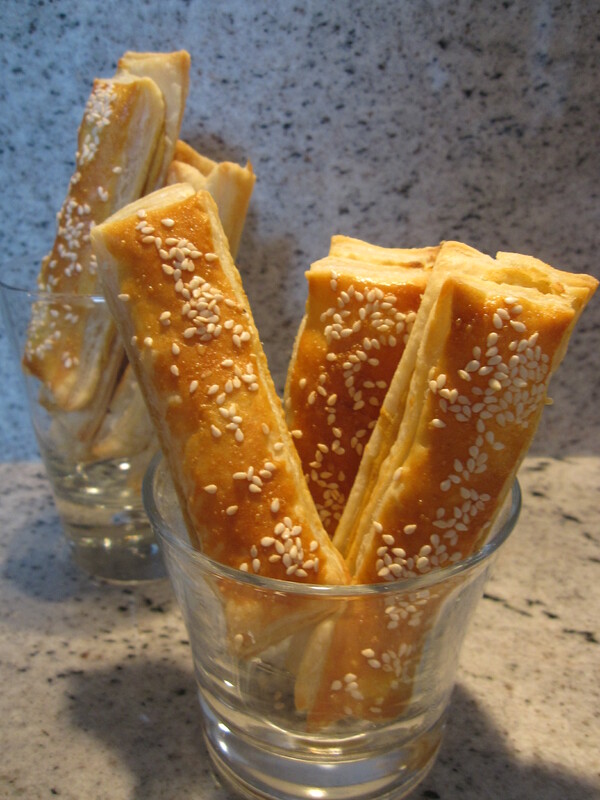 Basically, smear sheets of thawed puff pastry with some good mustard (Maille is considered a staple in my home), slice into strips, brush with egg wash, maybe add a sprinkling of sesame seeds, & bake… done! The end result is elegant enough to make an appearance at a fancy dinner party, yet easy enough that I would consider making a batch just for my husband and I to enjoy with a glass of wine. I had fun with these batons but had to substitute pesto for the mustard.